OVER 30 foreign victims of equity release scams gathered outside of Hacienda in Malaga yesterday to protest over an alleged fraud that could see many of them losing their homes. The mainly British group, led by Euan Armstrong and Ian Sherdley who formed the Equity Release Victims Association, filed denuncias with the Agencia Tributaria against a number of mostly Scandinavian foreign banks. They now hope Hacienda will intervene after they highlighted Spain is losing a large amount in taxes due to fraudulent schemes where all the money is invested and lost in Luxembourg. “We already presented all this evidence to the Supreme Court of Spain in Madrid and they chose to ignore it so this way we are bringing their attention to the loss of tax to the Spanish coffers,” said Armstrong, 74. “It went very well. A good number turned out and each person filed a denuncia with Hacienda. “We are exposing the situation to the tax office that these banks are taking money from Spain and lodging it in Luxembourg. Spain stands to lose a lot of money. 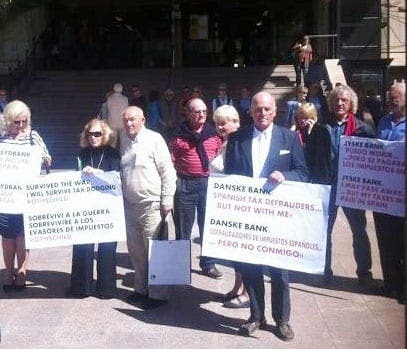 The group, represented by Antonio Flores from the Marbella based firm Lawbird, demonstrated for over an hour carrying placards which attacked some of the banks they claim have tricked them. According to the group foreign banks convinced predominately retired foreigners to take out ‘predatory mortgages’ on their homes at a value way above the level of the official appraisal. Victims were lured in by the false hope they could reduce inheritance tax for their loved ones – who would eventually be liable to pay Spain’s top rate of 34 per cent – and enjoy a salary for life by investing in financial havens such as Luxembourg, supposedly without risk. But the scam – which could have as many as 600 victims and is estimated at a staggering 250 million euros – has left many of them penniless. This entry was posted in In the Media and tagged Antonio Flores, Equity Release, Lawbird on April 11, 2012 by admin.